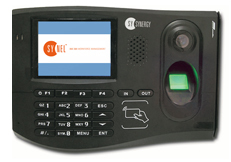 SYNERGY the advanced time and attendance terminals from Synel Mll Payway LTD.
Synergy terminal designed for Time and Attendance with many technological features such as: fingerprint scanner for employee’s identification or employee’s verification, and many type of reader such as standard RF card reader and Mifare technology and the known HID reader. For example when employees swiping card at the terminal or when employee rejected by the terminal for any reason. Many companies using this feature when employees swipe to meal coupon to prevent misunderstanding when the employee is charged for the meals.